Mikhail Botvinnik won seven consecutive major tournaments from 1941 to 1948, including the tournament held to determine the champion upon Alexander Alekhine’s death. There’s little doubt that he would have defeated Alekhine, and it seems certain that he was the best player of the 1940s. Remarkably, Botvinnik was an engineer by profession and didn’t dedicate himself to chess the way most of the champions did. He lost his title to Vasily Smyslov in 1957 but won it back in the return match the next year. He then lost to Mikhail Tal in 1960 but again recaptured the title in the return match. The return match clause, stating that the champion has a right to a rematch if defeated, was stricken in 1963 when he lost to Tigran Petrosian, and no one will ever know whether he would have managed to score the hat trick. Despite a fairly tarnished record in championship match play, Botvinnik was clearly the best player in the world for many years. None of his challengers could make that claim. In 1945 a famous radio match took place between the United States and the former Soviet Union. Botvinnik, as black, was paired on the top board against Arnold Denker. The position shown here is reached after white’s 22nd move. Botvinnik shatters white’s king protection with a temporary rook sacrifice. The alternatives were also grim. 24. Bh6 would have lost the queen to 24… Qxf4. 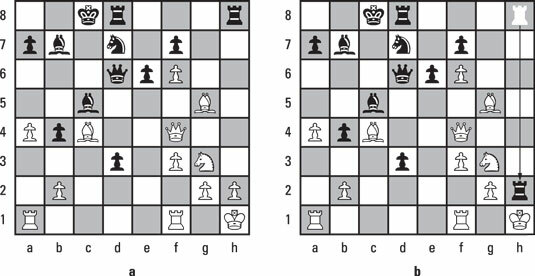 Notice that the bishop would have been pinned and unable to capture black’s queen. Also, the attempted move 24. Nh5 would have failed to 24… . Rxh5+ 25. Kg3 Rxg5+, when it would have been the white queen’s turn to be pinned. The queen is now attacking both of white’s bishops. Because white can only save one of them, Denker resigns.